The purpose of the present study was to compare arterial pressure (AP) and heart rate (HR) responses to submaximal isokinetic, isotonic and isometric exercises currently employed in physical rehabilitation therapy in terms of both magnitude and time-course. To this aim AP and HR were continuously and noninvasively measured in ten healthy subjects performing isokinetic, isotonic and isometric exercises at the same relative intensity. Isokinetic and isotonic exercises consisted of 30 knee extension/flexion repetitions at 40% of maximal effort. Isokinetic speed was set at 180° · s−1. Isometric exercise consisted of a 60-s knee extension at 40% maximal voluntary contraction. The AP showed a rapid and marked increase from the onset of all types of exercise progressing throughout the exercises. Peak systolic (SAP) and diastolic (DAP) arterial pressure were 190.7 (SEM 8.9) and 121.6 (SEM 7.8) mmHg during isokinetic and 197.6 (SEM 11.2) and 128.3 (SEM 7.7) mmHg during isotonic exercise, respectively. During isometric exercise peak SAP and DAP were 168.1 (SEM 6.3) and 102.1 (SEM 3.7) mmHg, respectively [both lower compared to isokinetic and isotonic exercise (P < 0.05)]. The HR rose abruptly and after five isokinetic and isotonic repetitions it had already increased by about 30 beats · min−1, continuing to rise throughout the exercises. The HR response to isometric exercise was significantly less (P < 0.05) at all times. An immediate fall in AP, undershooting resting levels, was observed at the cessation of all types of exercise, being more marked after isokinetic and isotonic exercise. 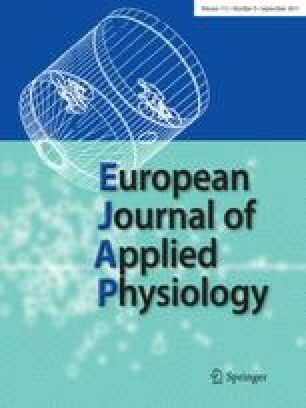 These results indicate that submaximal exercise of a dynamic type induces greater AP responses than intensity-matched isometric exercise and that even submaximal endurance-type rehabilitation exercise yields an elevated functional stress on the cardiovascular system which could precipitate hazardous events particularly in subjects with unrecognized cardiac diseases.